The object of the game is to let your buses ride their line and to transport as many passengers as possible. The action Vrrooomm… is the only one that scores you any points. A player choosing Vrrooomm… can ride his buses. He does this in the following way. Each bus can transport a maximum of one passenger. If you have only one bus, you can thus transport only one passenger. The passenger is taken from the crossing where he stood waiting and is put down at the crossing where he wants to be. Buses can ride only their own lines. Passengers or buildings which are on a crossing that is not connected to one of your lines cannot be used. On each crossing, there can be passengers and buildings. De-pending on the time of day as indicated by the clock, passengers will want to be in a certain kind of buildings: their houses, their offices or the pubs. Each building can contain a maximum of one passenger. Passengers that are on a crossing which does not have the type of building needed want to get away. To indicate which players want to get away, it is practical to put all satisfied passengers on their respective buildings. Only passengers that want to get away can be transported. Of course, one needs an empty building of the right kind to bring the passenger to. This building should be on your own line. Each building can only contain one passenger! If there are no dissatisfied passengers, a player cannot ride his bus. If there are more passengers or empty buildings than the player can use, he or she may freely decide which passengers, or buildings, to use. You must transport as many passengers as possible (keeping in mind the number of buses at your disposal). If a player chooses the action Vrrooomm… more than once, he may use all his buses again each time he performs the action. For each passenger that you move, you score one point. These are counted on the islands on the map. The first player to score a certain score puts his stone on the island. If someone else later scores as many points, her stone is put on top of that of the first player. Example: First the clock (left figure). Time goes on from night to day, so the citizens want to go to the offices. 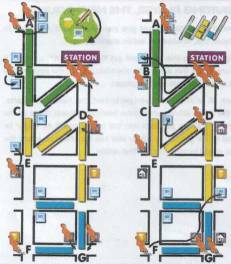 For clarity, passengers on crossings with offices are placed on the buildings (A, B). The one at E crosses the street for that purpose. The passengers at D and G want to leave, because there are no offices there.